I had a primary school teacher who was so motivated and passionate that she determined the course of my life. As a young adult I realized that I wanted to empower my life and that of many other people through teaching. So I decided that ‘Educational Sciences’ was to be my course of study at the University of Turin. Teaching is not only my job, but it is also my passion. I take enormous satisfaction in helping my students to learn and overcome what they thought were their limits. Since I graduated I have taught Information Technology to adults and children, Quality (ISO 9001:2000) to adults, and English and French to children. 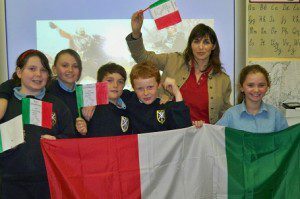 For the last five and a half years I have been teaching Italian to adults and to children in Cork. Having studied English, Italian, French and Latin grammar gives me a good starting point in understanding how students think. Naturally, grammar is useful, but it is not enough. I love using educational supports such as role playing in real life situations, using flash cards and other interactive methods to keep my students’ interest and motivation high. Dulcis in fundo, I absolutely believe that the vicarious experience which I can offer my students can be a great support to their successful and fulfilling learning experience. This is a question that I have been asked so many times by my students. They are always so surprised to know that I came to Ireland to study English and that I decided to stay here, in spite of the weather. 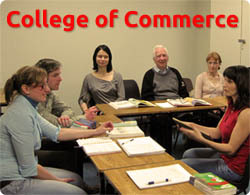 My first time in Ireland was summer 2005 and I went to do an intensive two week course in English. I was amazed by this beautiful country and its people, always so welcoming and friendly. I didn’t even have time to bother about the weather as I was totally absorbed in my studying. I started studying English then and had a lot to learn. The second time I came to Ireland was in May 2006 to improve my English further. At that time, I thought that four months was enough time to become fluent… It turned out that I was wrong as I am still here. While I am still learning, I have built up my little family. Joady, my husband is Irish and we have a little boy, Kevin who turned six last December. Thus, I think I’ll be here for the long haul! Besides, I have many students and friends whom I love very much and I would terribly miss them if I moved away. As I had to provide for myself at a quite young age, I went to work when I was 17. I was a … hairdresser for many years. This is why we save a fortune on hairdressers and barbers in my family! At 23 I felt that I was not complete and satisfied with my life. I was longing for the feeling of fulfilling and empowerment which I always had during my years in school. Therefore, I went back to study. I finished my secondary school at night time as I was working during the day. It was quite tough, but I was happy as I felt I was empowering my life through studying subjects such as Psychology, Pedagogy, Italian literature, and also Latin and Maths. Besides, in Italy we have several types of secondary schools. I was attending the ‘Scuola Magistrale’ which was to prepare future teachers. At 26, I finally started ‘Educational Science’ at the University of Turin. During my course of study I went on Erasmus to Paris. At that time, the Department of Educational Science at the University of Turin had only two positions and both were for Paris. I packed up and went to study and work there for a year. I loved Paris! Its inhabitants are so ‘interesting’, so it’s no wonder I found Irish people so friendly and welcoming years after! My course of study was 4 years and at the end of it I had to defend my theses and I was awarded first class honours. The title of my qualification is: Dottore in Scienze dell’Educazione. 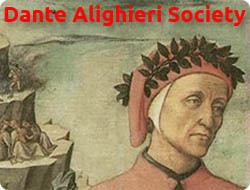 The title of my theses was ‘Le mappe concettuali e l’apprendimento. Una ricerca empirica’. Here is the official translation in English. I was then fully qualified to teach in schools, pre-schools, training centres and in professional environments (companies). I started teaching IT to adults and teenagers and I truly loved it. Later on, I completed a postgraduate course in Quality Management as it was applicable to Education. Therefore, I became the Quality Manager for Infor (a training centre not too far from Turin) and I added Quality Management to the list of subjects I was teaching. Afterwards, I became an internal auditor and Quality training manager for a big glass company (Bormioli, Fidenza). Later on I was offered the same position with the prospect of great advancement in a company much closer to my home in Turin. In order to advance in such a company I had to improve my English. Now, you will tell me what happened, in italiano per favore!